War of the Green Lanterns: Aftermath is a mixed bag. It added significantly to my enjoyment of War of the Green Lanterns itself, and for that I credit writer Tony Bedard (sharing book credits with Peter Tomasi). Bedard's contributions, however, also contain some troublesome moments; Tomasi delivers solid work, but the majority of it is entirely unrelated to War. In this way, Aftermath is a book headed in many different directions; I'm always glad when DC collects their comics, but the Aftermath collection is an unusual one. The beginning of Bedard's two-issue Aftermath miniseries is quite moving. Bedard focuses on fan-favorite Kilowog in the opening scenes, using him as the through-way to depict the Green Lantern Corps's pain and mistrust of their Guardians, and vice-versa. Trauma due to mind control is hard to demonstrate, but Bedard personalizes it. Any time the Guardians's assistant Salaak disobeys them is also notable. Bedard has spotlighted former Guardian Ganthet throughout his Green Lantern Corps run, not always adroitly, but here the scenes believably present the Corps's conflict between their duty and their loss of faith. But with the good, there's bad. I have never liked Bedard's characterization of Lantern Kyle Rayner. Under Bedard's pen, Rayner speaks with "gottas" and "couldas," becoming an angsty, over-emotional, stereotypical version of himself that other writers, including Tomasi, have written with more care. Bedard writes Rayner's girlfriend, Lantern Soranik Natu, with equal simplicity, such that two characters who came together under Tomasi so thoughtfully, now spend their scenes under Bedard shouting over petty misunderstandings until they break up. 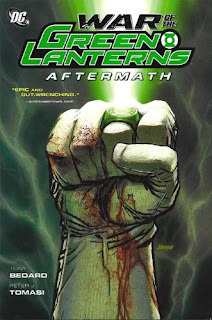 After the initial good scenes, Aftermath focuses on a Lantern plot to kill enemy Sinestro, which any reader knows won't succeed and therefore just takes up pages. It's a vehicle to bring Natu and Rayner to blows, and then the couple fights again in one of Bedard's two Green Lantern Corps issues collected here. Natu learns that Rayner pretended to see Natu in a Star Sapphire-generated vision of true love, when he actually saw his then-dead girlfriend Jade. It is not Rayner's classiest move, but there's so many mitigating factors, from Sapphire trickery to the fact that Jade was, hey, dead, that Natu's rage is ridiculous. Bedard's angry Natu is also a stereotype of the character at best, and of women at worst, that's less than what the character deserves in her last pre-Flashpoint appearance. Another Corps issue here is by Bedard, and then there's a third by Scott Kolins with a host of artists. Bedard's issue follows John Stewart and a new Lantern; of all the aspects of War, I find this idea of new, morally-suspect Lanterns chosen by their enemy Krona to be the most interesting and I hope this continues to be explored. Kolins's closing issue offers short stories about various Lanterns, succeeding more when it focuses on Lanterns with whom readers are familiar than it does when it focuses on more esoteric ones. Tomasi's contribution is three Emerald Warriors issues starring Guy Gardner. These are interesting in the style of Dave Gibbons's early issues of Corps -- Gardner goes on violent, Suicide Squad-style missions, handling them as only Gardner can. Any stories where the writer handles Gardner as a capable-if-hotheaded adult get a thumbs up from me, but two of the three make no mention of the events of War -- they're inventory stories, to be sure. I don't begrudge DC clearing the decks before the New 52 relaunch and I'm glad they collected them, but it's strange reading when, of the closing three issues, the second relates to Aftermath and the first and third do not. There's not much plot at the center of Tomasi's final issue, teaming Gardner and fresh-from-Batman, Inc. Bruce Wayne, but that's not the point. Tomasi pairs Gardner and Batman as equals; the two have famously feuded, and Tomasi quite purposefully ignores this until the very last panel, where Batman and Gardner joke about it. I had imagined perhaps that Tomasi might've been able to borrow long-time Gardner writer Beau Smith's imagined final scene for a Batman/Gardner team-up; that's not the case, but what Tomasi writes is still well done. One of Gardner's best-known (and perhaps lowest) moments was Batman knocking him out with "one punch" in Justice League #5, not long after Legends at the beginning of the post-Crisis DC Universe. Even though Gardner continues mostly as is into the DC New 52, Gardner's perfect "final" scene not only shows he and Batman being respectful to one another, but joking about their feud -- it's water so far under the bridge that they can laugh about it. Various heroes are getting their various appropriate endings (or not) as the DC Universe reboots; this is one of the right ones. War of the Green Lanterns: Aftermath starts strongly and finishes well (if not on topic), but the middle lacks the dynamism we saw from Tomasi's Green Lantern Corps: Emerald Eclipse or Geoff Johns's Green Lantern: Rage of the Red Lanterns. I liked War itself better the second time I read it, but we can all agree War of the Green Lanterns was not of the caliber of Sinestro Corps War. Here on the cusp of the DC New 52 reboot, I hope the new universe serves to reinvigorate these series; I've heard rumblings of such, and that makes me optimistic. The green machine rolls on with the Collected Editions review of Green Arrow: Salvation, the final tie-in to Brightest Day. Don't miss it! I found that very last issue, with Guy and Batman on the space station, kind of Silver Age-y in its logic. Why does the international space station have all of these internal defenses (robot tentacles? really?)? The bad guy tries to escape in a speed-of-light space plane by flying off away from Earth? Where was he going to go? He claimed to be working for the League of Shadows, but was a NASA Ph.D.? Also, why would an experimental speed-of-light space plane, about to go on a test flight, have a giant laser cannon on it? I mean, yeah, it's a comic about a guy with a magic green ring that can do anything. There's certainly a high level of "suspension of disbelief". But just the way that particular issue was written, it reminded me of reading an old Silver Age comic with its laugh-out-loud silly logic. That being said, overall I liked the book well enough. The Aftermath issues were a pretty good epilogue to the war, despite the Kyle/Soranik issues that you pointed out. Yeah, I spent so much time griping about Natu here, I pretty well glossed over the plot of that Batman team-up issue; I say "there's not much plot," you say "it's Silver Age-y," and we might be saying about the same thing. Basically that close to the Flashpoint reboot, most important to me was that Tomasi closed with Guy and Batman as friends, and he got that, so I'm satisfied enough. I'm soon to read Tomasi's first New 52 Green Lantern Corps trade, which I'm pretty excited about.